Launched in the USA in the Autumn of 2011, Redakai trading cards were quickly followed by a series of Redakai toys and action figures featuring many of the characters introduced on the cards. Whilst UK fans only had to wait until Easter 2012 to get their hands on these awesome Spin Master products, we know that Redakai Trading Cards are one of the biggest swapping and collecting phenomenon after Pokemon and Yu-Gi-Oh. Redakai: Conquer the Kairu is an animated TV show which follows the adventures of Ky who is a young 15 year old student studying the history of early martial arts. His mission is to find the ‘primordial energy force known as the Kairu’, assisted by his teenage friends Maya and Boomer. They need to defeat the forces generated by the evil Lokar, and once they've gained the Kairu energy their enormous power enables them to change into dominant warriors! 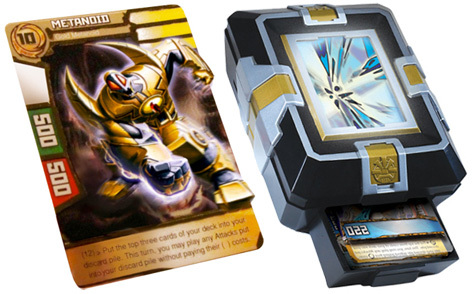 The Redakai trading cards are closely linked to the show and are a new category choice for Spin Master who are also well known as the makers of Bakugan. Young fans will be blown away by the '3Dmatick' technology which is used in the Animation Box. When a card is inserted in the lower tray an image is projected onto the screen and also tracks a player’s progress through the game. The Redakai action figures we're seen look equally as incredible - and they look set to complement the card game brilliantly.